Going Deep: Could Daniel Mengden Be Turning a Corner? I don’t really know why, but I have a penchant for pitchers who are unique. I’m not just saying I like pitchers who throw awesome pitches, I’m saying I like the guys who look weird, who have weird windups, and I like the guys who throw absolute filth (doesn’t everyone?). One guy that I’ve come to be really fascinated with is Oakland Athletics pitcher Daniel Mengden. That’s a work of art right there. 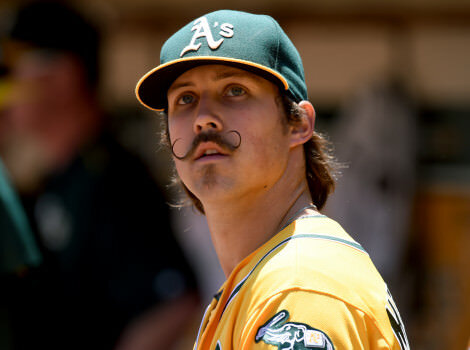 If anything, Daniel Mengden, The Hipster on the Hill, The Marvelous Mustachioed Man on the Mound, has got the a e s t h e t i c.
I mean look at that thing. It’s loaded with weird ticks and looks like it’s ripped right out of the 1970s (just like his mustache). But it’s more than just his look and his windup that interests me — it’s his potential. On the year so far, Mengden has a 4.50 ERA, 6.75 K/9, and a 1.17 WHIP, so you’re probably saying “Ben, why are we talking about this guy? Do you have a thing for Oakland pitchers? Is it the mustache? What’s wrong with you?” And that’s totally fair, I ask myself that last question every night before I go to bed while looking at myself in the mirror and listening to Sufjan Stevens. Here’s the funny thing about Mengden — last year, his stats looked pretty good at first glance, with a 3.14 ERA and 1.05 WHIP, but they weren’t supported by his peripherals, as he ended 2017 with a 4.25 FIP. But this year is different, as he’s got that nasty 4.50 ERA, but his peripherals suggest he should be better, with a 3.09 FIP and a 3.59 bbFIP. So the question now is this — is Mengden good now? What’s changed? Why do his peripherals suggest that he’s getting unlucky when they suggested he was getting lucky last year? Well to answer that question, you need to know what Mengden’s two biggest problems have been. To understand Mengden better, it’s best to know what he throws. He’s got a repertoire of about four pitches he uses. First off, he’s got a fastball that, all things considered, is fairly run-of-the-mill. It averages about 92 MPH, topping out at 95, and has some above-average rise to it. It tends to get hit, and it’s the weakest pitch he’s got, as opposing hitters have a .354 wOBA and .176 ISO against it this year. He’s also got a changeup he throws that’s sort of a circle-change type pitch. He doesn’t throw it all that much and for good reason, it doesn’t really miss bats, with a 3.1% whiff rate so far this year (though it was 9.3% last year which isn’t bad). There’s also his slider, one of his two main strikeout pitches. Mengden’s slider is one of those sliders that focuses more on vertical motion than horizontal motion, and it’s worked pretty well, with a 15.6% whiff rate on the year so far. That’s a beautiful pitch. It’s a hammer, and it’s easily his best pitch, with a 16.4% whiff rate on the year so far. There’s no doubt there’s potential in Mengden’s repertoire, especially in his curveball and slider, but what’s been holding him back? Well first off, his control has been rough. He throws his fastball in the zone fine, at 55.7% last year, but his breaking pitches have had problems in the past, with a 34.3% zone rate on his slider last year (with a 42% chase rate), and a 32.3% zone rate on his curveball last year (with a 34.9% chase rate). That’s some noticeable improvement, especially on his curveball and changeup. Not only that, but he’s added some vertical movement to his breaking pitches, with an extra half-inch of drop added to his slider and a whole inch-and-a-half of drop added to his curveball. Mengden’s looked to be a lot more prone to making mistakes from the stretch than the windup. But so far this year, that hasn’t been the case. Opposing hitters are slashing .200/.257/.273 with a .240 wOBA and .073 ISO. So let’s sum it all up, why am I interested in Daniel Mengden this year? Why do I think he’s got potential? Because it looks like he’s made a change. He’s added movement to his pitches, specifically his curveball, he’s controlling his pitches better, and he’s pitching better from the stretch than he has before. Now look, it’s only been four starts so far this year, but the changes he’s made combined with the favorable peripherals (something he didn’t have last year) makes me very intrigued by him. Mengden’s always had solid stuff, he’s just always struggled in a few very specific ways, and it looks like he’s working on that. If it sticks, and again I want to caution that it might not, he could be solid. I’m not saying go drop everyone for him, but certainly keep an eye on him, he could be in for good things this year. Love this article, thanks Ben. That curve is Dirt Nasty!